In 2012, I visited the Kawaguchiko Music Forest in Japan. Situated at Lake Kawaguchiko, it’s a museum specialising in music boxes, organs and other automated musical instruments. 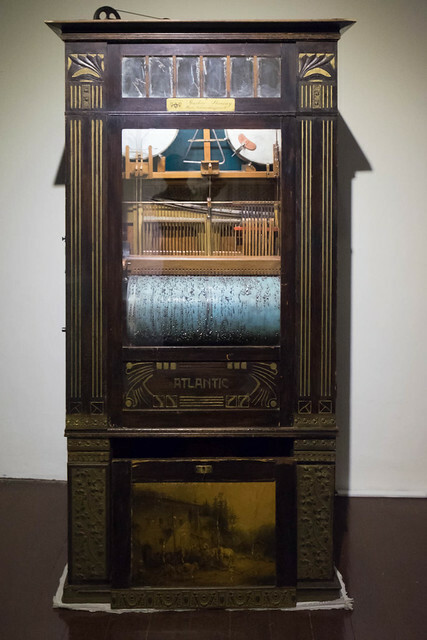 I was impressed by the antique music boxes and automated organs showcased at the museum, especially by that huge 1920’s Mortier Dance Organ at the entrance hall. 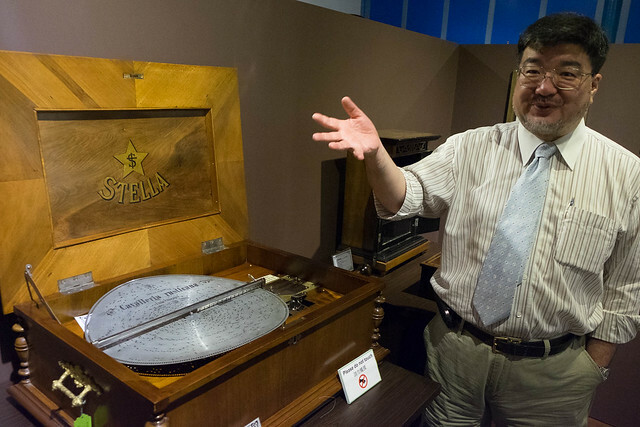 Fast forward to 2015, I was invited by the National Heritage Board to visit the Singapore Musical Box Museum. I was surprised that we actually have such a museum in Singapore and attended the tour to check it out. 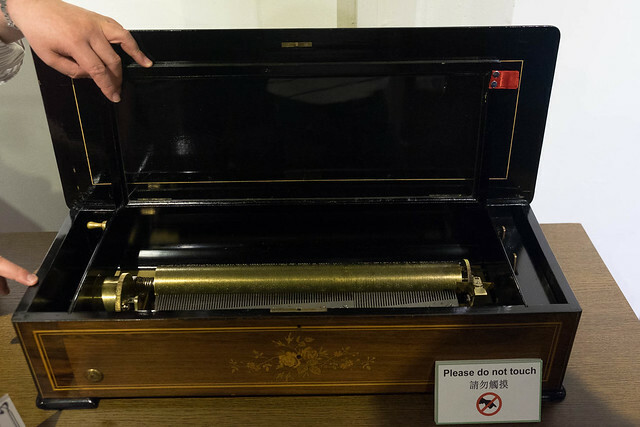 The museum is situated in the Chong Wen Ge building, next to the historic Thian Hock Keng Temple at Telok Ayer Street and owned by Mr. Naoto Orui, a Japanese collector of old music boxes. 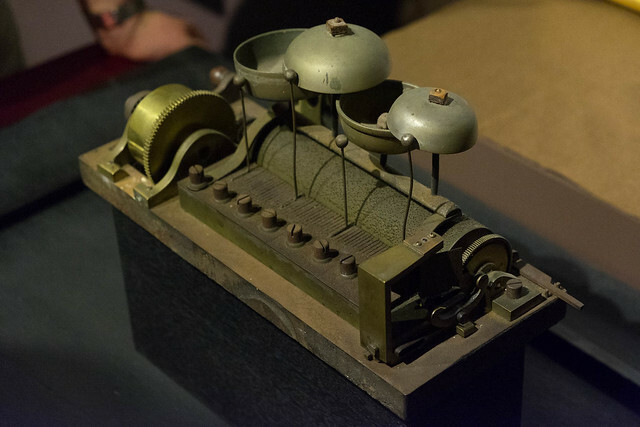 Music boxes are similar to the alarm/chime mechanism of old clocks. Both uses a wound-up spring, or in some cases, a falling weight, to drive another mechanism to play the tune/chime. But in both cases, purely using the spring to drive the playback would result in too high a playback speed. Thus, a spinning device called a “governor” is employed to regulate the speed by means of air resistance. Orui-san joked that that’s how the term “governor” (as applied to governing a country) came about. 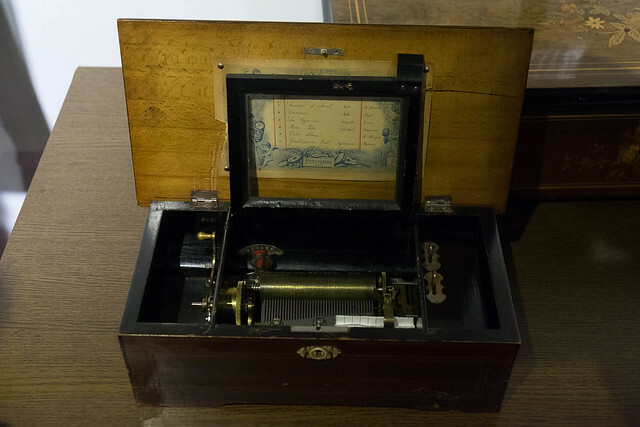 By itself, the mechanism of the music box, known as the “movement”, produces a very soft sound. 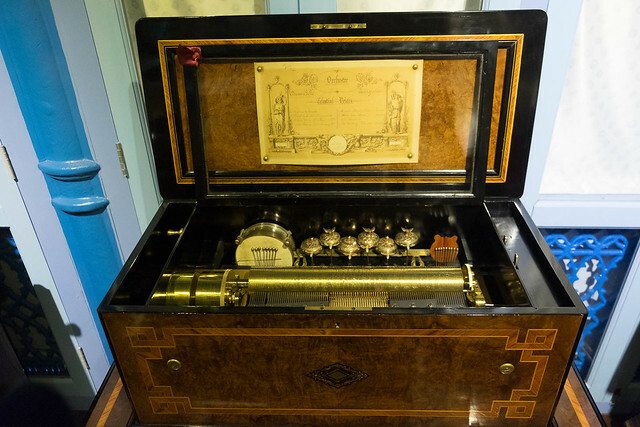 It’s the wooden case of the music box which helps to amplify the music by means of resonance. Here’s a nice Youtube video which explains how a music box works, if you are interested. In the olden days, other than live music, music boxes were what people used to listen to music in their homes. 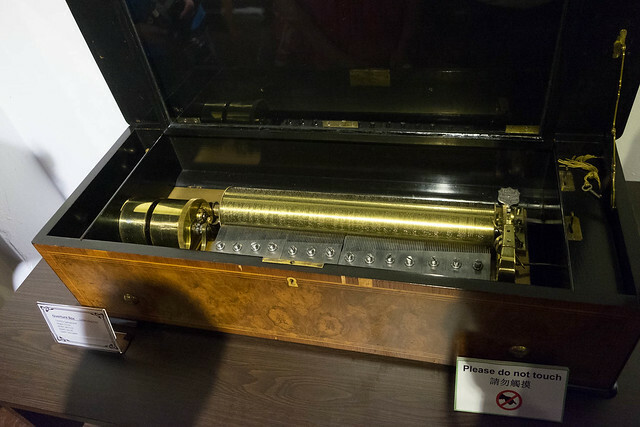 Only the rich could have afforded such extravagances back then, since, according to Orui-san, a simple music box with a 1-foot cylinder would have cost the equivalent of a horse back then. 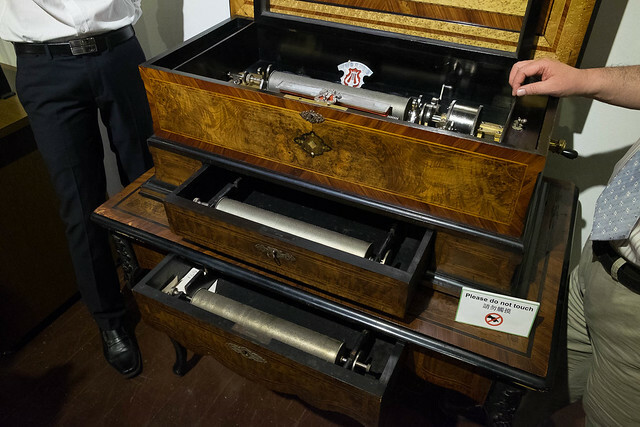 The first section of the tour concentrates on cylinder music boxes. These are made of a rolling cylinder with pins on it which spins and plucks the pins of a comb to make the music. You’re probably familiar or have seen this in action in modern music boxes. 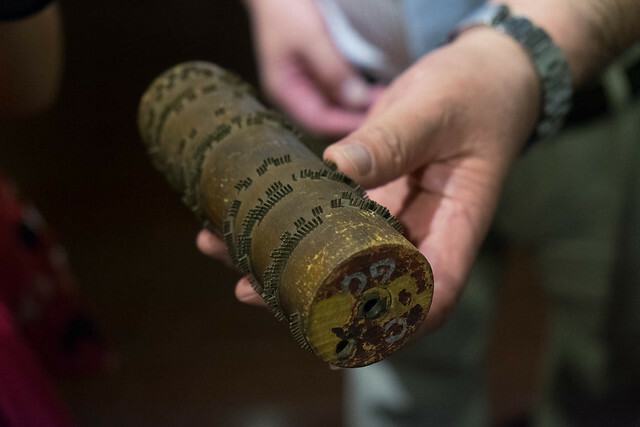 Orui-san showing a wooden music box cylinder with pins corresponding to the notes of the music piece. Mandolin Tremolo Zither, made in Switzerland in the 1880s. 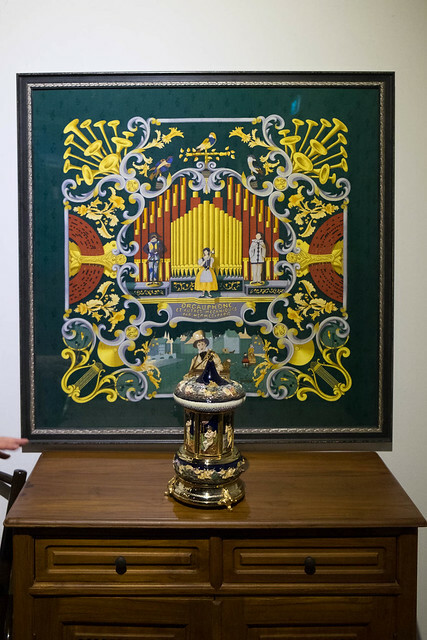 These music boxes can get rather elaborate, like this one, which had drawers to store interchangeable cylinders for different pieces of music. According to Orui-san, this cost up to the equivalent of a 4-horse carriage, quite a large sum of money! Music box + storage drawers. Orui-san also related to us an interesting anecdote. He had acquired a music box from a flea market for £10 as it wasn’t working, so he brought it back and tried to repair it. 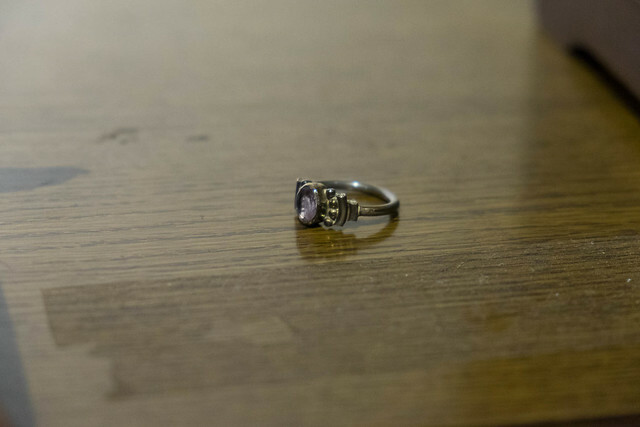 When taking it apart, a ring fell out from the mechanism, and he found out that’s the reason why it wasn’t working—the ring had jammed the mechanism. He had tried to return the ring and music box to the sellers, but they had declined, honouring that they had already sold it to him for £10. The ring which jammed the music box. Because of the way they work—a rotating cylinder plucking the teeth of a metal comb—music boxes typically produce only 1 level of loudness. However, there was one music box which circumvented this limitation by having two sets of combs—one for the louder notes, and one for the softer ones. 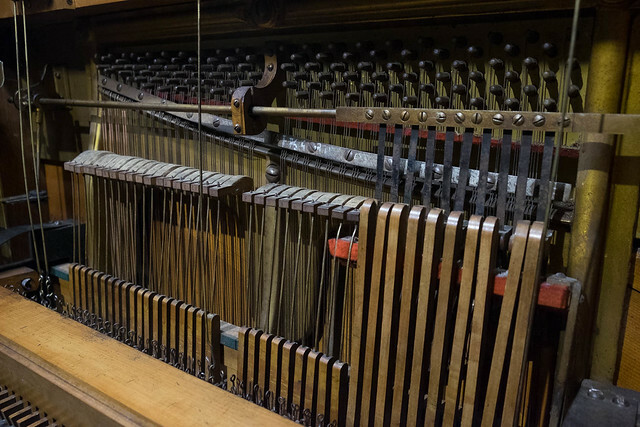 It was aptly named the Piano Forte (literally soft loud in Italian), just like the modern piano, and gave a richer, slightly more dynamic musical playback. 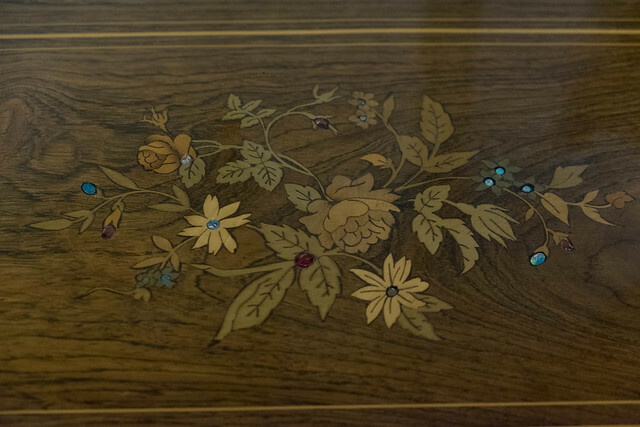 The Piano Forte music box showcased in the museum is made in Switzerland in the 1880s and has jewellery inlaid into the top and front of the box. Another interesting piece is the Roller Gem Organ made in the USA in 1885. It’s a hand cranked organ with a range of 20 notes. Next, we move on to disc music boxes. 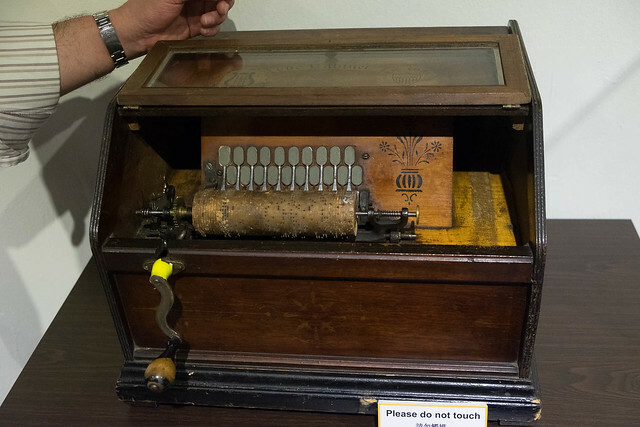 In 1886, German music box artisan Paul Lochmann created a music box that used a punched disc instead of cylinders for storing the music. This revolutionised the music box industry as discs can be mass produced, unlike cylinders of the time, which had to be hand made. Thus, disc music boxes can be made for a much lower cost and be brought to more people to enjoy. 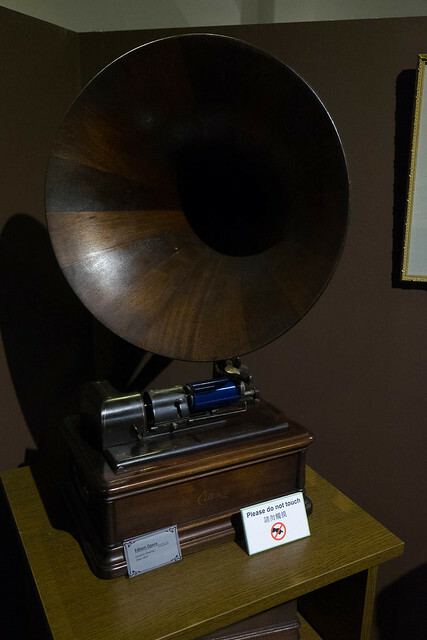 These disc music boxes were reminiscent of the gramophone and record players. Just like you can change a vinyl record to listen to a different piece of music, you can change the disc of a disc music box and get a different tune. Orui-san talking about disc music boxes. Next to him is a Stella music box. At the far end of the museum are the big guns. 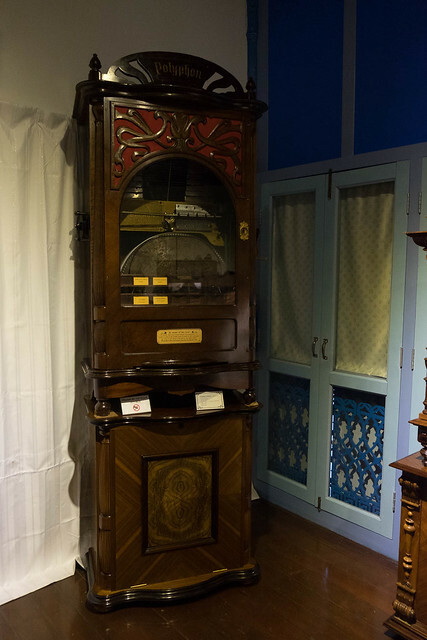 Huge music boxes are on display here, and these are the precursor to the music jukeboxes. The most interesting is this music box called the Atlantic. According to Orui-san, it was to go into the Titanic, but they wanted a larger box on it, and this went to the Atlantic instead. This huge box is powered by a falling weight which is raised by winding a crank (sort of like how grandfather clocks work) and has a piano, mandolin, bass drum, snare drum and even a triangle. A coin needs to be inserted to start the music. And this is how the whole shebang sounds like. Another multi-instrument box is the Langdorff Orchestral Music Box made in 1890 in Switzerland. It has Drums, bells, castanet and a double-reed, 26-note organ. Finally, we have the Polyphon 5, a multi-disc music box which is the predecessor of the jukebox. There’s a drawer below to store all the music discs, and the one which was on demo is the famous Bach-Gounod Ave Maria. Like the Atlantic, this also required a coin to be inserted to start the music playback. Orui-san left the star of the museum to the last part of the tour. 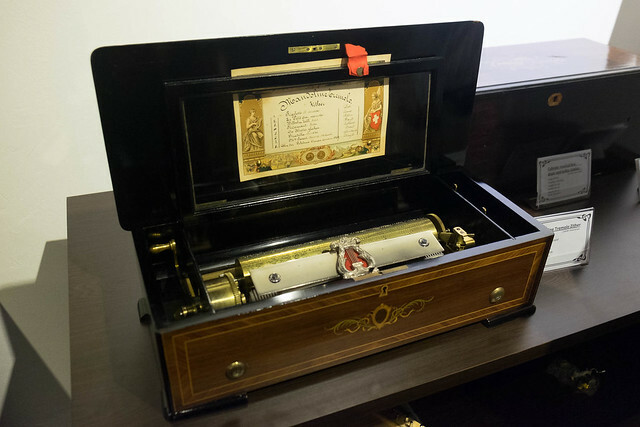 Named “China”, this was a music box movement made in Singapore(!) in the late 1800s. It was from a time when Singapore was still a British colony, and watchmaking, as well as music box making skills were passed down to the locals. 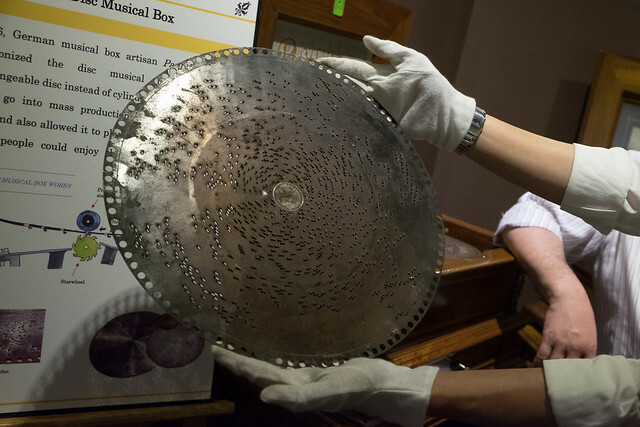 “China” music box, made in Singapore in the late 1800s. Unfortunately, the unit on display is still awaiting restoration and thus isn’t working. It’d have been interesting to hear what it sounds like. 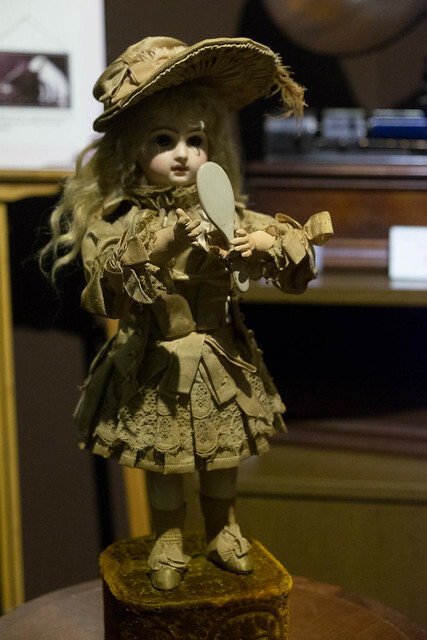 Musical doll which plays music and pretends to look at herself on the mirror. And finally, a silk scarf by Hermès to commemorate the year of music in 1996. In front of it is a musical cigar holder. Limited edition scarf by Hermès made for the year of music in 1996. 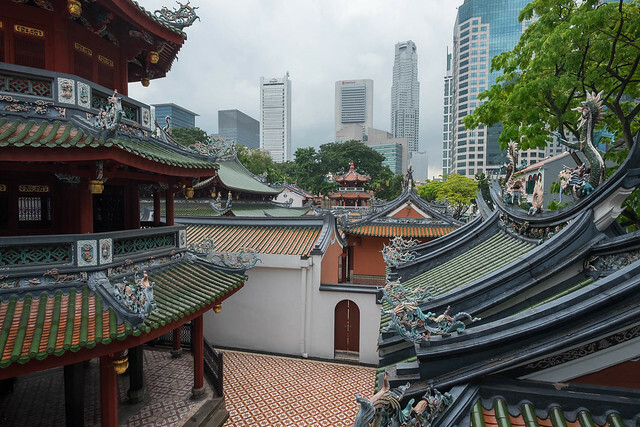 At this end of the museum, we can go out to the balcony, which offers a great view of the pagoda and Thian Hock Kheng and Singapore Yu Huang Gong temples. View of the Chong Wen Ge Pagoda and Thian Hock Kheng / Singapore Yu Huang Gong temples in the distance. Thanks to Orui-san, the curators and also to the National Heritage Board for inviting me to this eye-opening (and ear-opening) tour of the Singapore Musical Box Museum. Hourly tours are available from 10:00 to 17:00. This entry was posted in Photography and tagged chong wen ge, museum, music box, musical box, Singapore, thian hock kheng. Bookmark the permalink. I am the publisher/editor for the Musical Box Society International (MBSI) and we publish a magazine called Mechanical Music six times a year. One of our members recently visited this museum and was quite impressed. I enjoyed your writeup about it and I would love to be able to reprint the article with photos if you would be willing to submit it for publication to our magazine. Please feel free to get in touch with me at your convenience.